Quite a while back we had several conversations about John Deere hydraulics “drooping” and how it might be helped by using Regular Hy-Gard, which has a high viscosity. Well I am here to report that the drooping has drastically reduced with a change from Low-Vis to Hy-Gard but I may have introduced another problem. I have been scratching my head lately trying to figure out why my 3 point hitch “hiccups”. Every minute or so it will drop about an inch and then jump back up. I was thinking there was an air leak in the hydraulic system somewhere but I‘m not so sure now. If it is drawing air in one direction it should be leaking oil when the flows reverse and there are no visible leaks. After reading some of the old threads that have popped up recently I began to think about oil foaming in the HST. There are some vague references to Low-Vis being better for HST’s due to reduced foaming but nothing for sure. One thing is for sure; IF I am getting foaming it can’t be good for my transmission. What do you folks think????? My 4310 is a 12/12 reverser so I can't speak for Hydros or other brands but I had a 4300 12/12 that came with rtegular Hy Gard. It had a lot of pump whine in the winter till I switched to Lo-Vis. Does you three point hickups only happen with the hitch lifted to the top? I haven'toblem with the 3410, but used to have that happen on regular farm tractors. If I remember correctly it was an adjustment issue in the valve that connects to the control lever which tells the three point where to stop and stay. Mark, I think you're mixing two different kinds of 'hiccup' and the causes of each. Air, most often in things like the FEL, will cause more of a 'bounce' caused by the cushioning (almost spring-like) effect of air being compressed then pushing back. The kind of problem you describe is more often caused in my experience by an internal hydraulic leak. Fluid if leaking past the piston seals of the internal cylinder that lifts the 3pth. When it droops far enough the automatic position control or something senses the drop is not in accordance with where the control lever is set and loads it back up. You won't see the leak because it's draining right back into the reservoir. I'm willing to bet you park the machine with a fairly heavy object on the 3pth and all the way up, shut the machine off and you can nearly watch it settle back down. That test would tell a lot, and there's other possibilities, but that's the most likely. Mark I have the same issues. I run the low-vis also. The 3ph will leak down the 1/4" or so and then self raise. 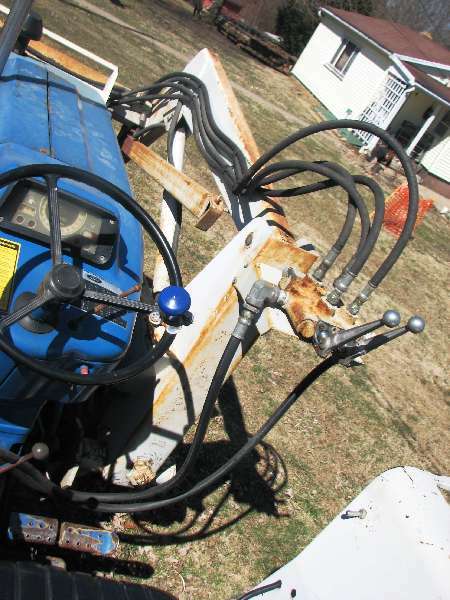 The loader is the same it leaks down even with tractor running but that does not self raise. I am not easy on the equipment so some seal or o-ring leakage as long as it still works does not concern me now. It did when I first noticed it. It's a 02 with about 1700 hours on it now.